Except for their rather unpleasant habit of spitting, llamas are friendly, pleasant, rather regal looking critters. “When correctly reared” they will rarely spit at humans. So says Wikipedia. The spitting is kind of cool, really. You can tell how mad a llama is by the content of their spit. As they get more irritated, they pull their spit from deeper and deeper within their stomach. 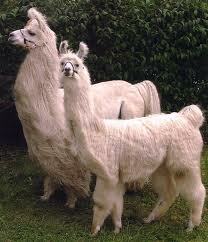 Since they have three stomachs, you really don’t want to irritate a llama. Fairly recently, I knit for the first time with llama. I used Mirasol Miski. It’s 100% baby llama, known as cria. Miski is a wonderful knitting experience. Very soft, a bit like the softest alpaca. The Mirasol Project is named after a child, Mirasol, who helped tend a herd of 3000 alpaca on a ranch high in the Peruvian Andes. 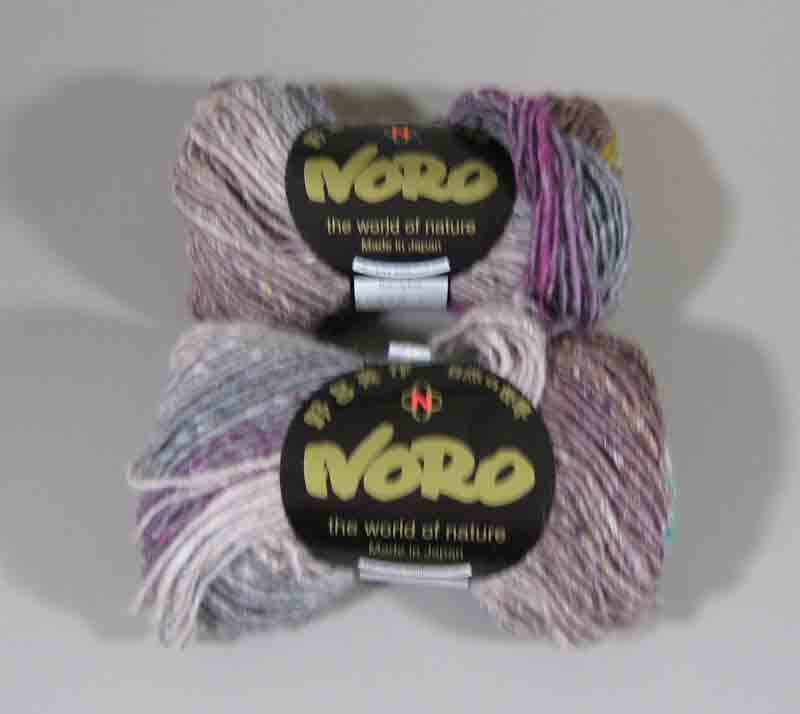 Proceeds from yarn sales help support a school and health center for the herders’ children. This is a Common Brushtail Possum, of the sort native to Australia. Marsupials are not exactly the kind of critter we think to invite into a yarn stash. But looks don’t tell all. 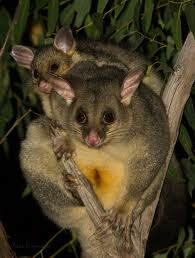 This possum was introduced to New Zealand by European settlers in 1837. They thought it would be nifty to start up a fur industry with a non-native species. There are no possum predators in New Zealand. Since then, possums have achieved serious pest status in New Zealand, both from a conservation standpoint and because of the agricultural damage they cause. So it’s all out war on the possums in New Zealand. 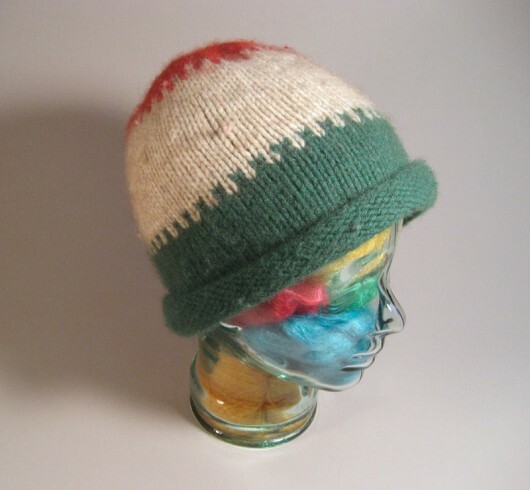 That’s where us knitters come in, though certainly it’s not a concept without some controversy. My way of thinking about it is that these possums are being trapped and killed and if we can get some good out of their sad story I’m in favor of it. I draw the line at learning to knit with yarn made out of Cane Toads, but possums I’m OK with. Hand plucking is the best way to avoid destroying the buoyancy of the hollow fur shafts. When possum pelts are properly handled, the fur can be successfully spun with merino wool. The yarn that results is super soft, resists pilling, has a slight halo, and has wonderful heat retention qualities. The first time I knit with possum was the last time: the now discontinued Furlana. It was 30% possum, 70% merino wool. It was hard to find in the states. But the yarn was wonderful to work with. It had a little problem that I’m sure the industry has licked by now. Until you gave the yarn a thorough bath it stunk something awful when it got wet. My son was about 7 when he came in from the snow and we had to wash the hat, as well as his hair. 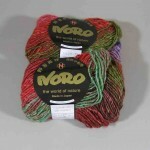 But I’m thinking of helping out the New Zealander’s conservation effort by trying possum yarn again soon. There are some great yarns, spun with as high a possum content as 40%. 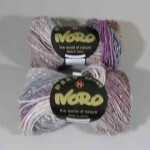 Check out Supreme Possum Merino, or Touch Yarns. Or if you are in a hurry to try possum fibre, check out the ready-made lines at Merinomink or New Zealand Nature. 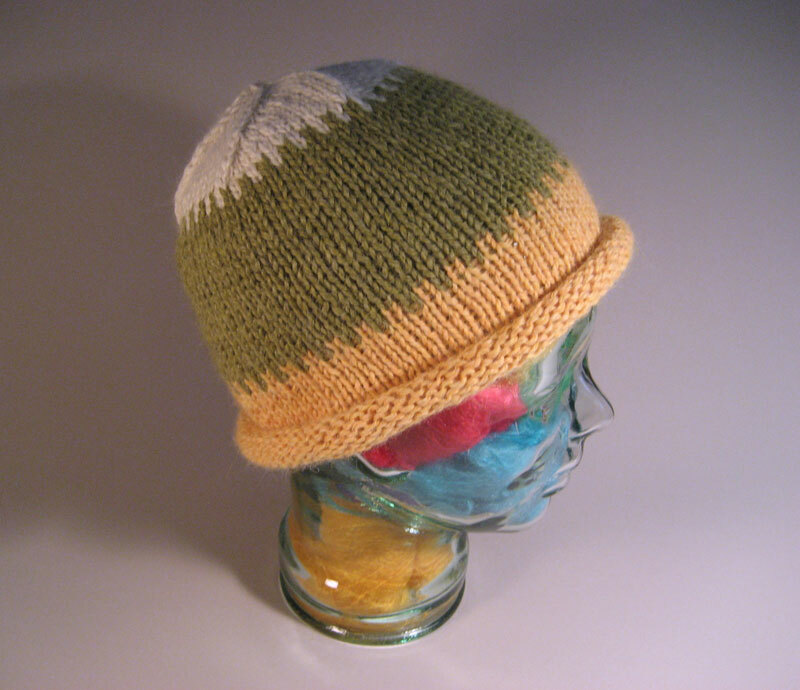 Here are my hats knit in Furlana. Still being worn, still warm, about 12 years after I knit them. There are hundreds of watchcap patterns out there. They are either all ribbed, or with a ribbed cuff. They are unisex. 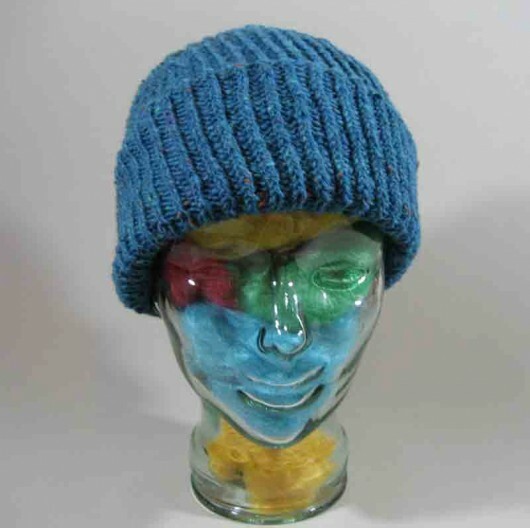 They are a fast and easy knit. What distinguishes one from the other is the type of rib and the top treatment. 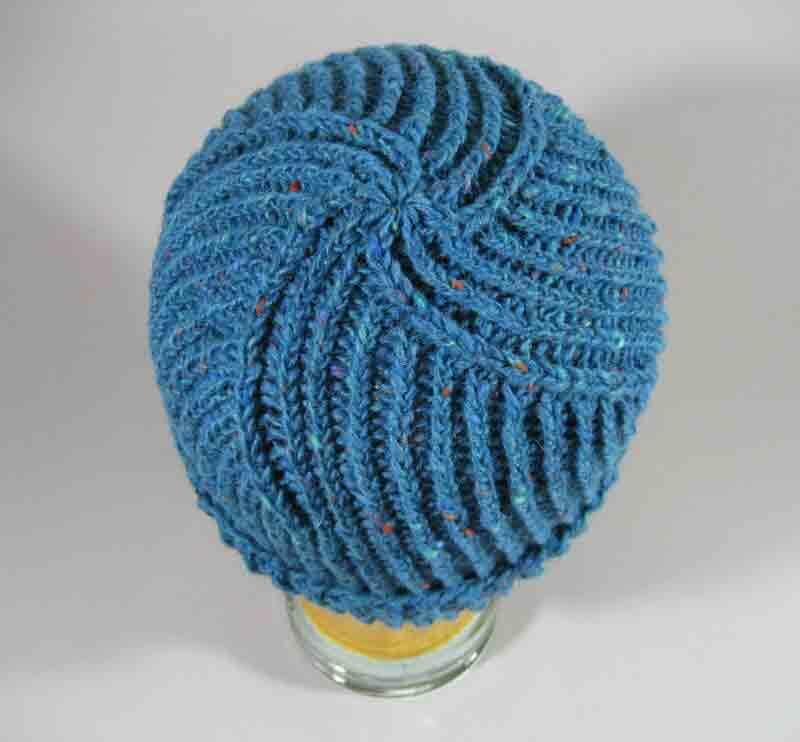 Staceyjoy Elkin has come up with a clever and very serviceable version: her Marsan Watchcap. 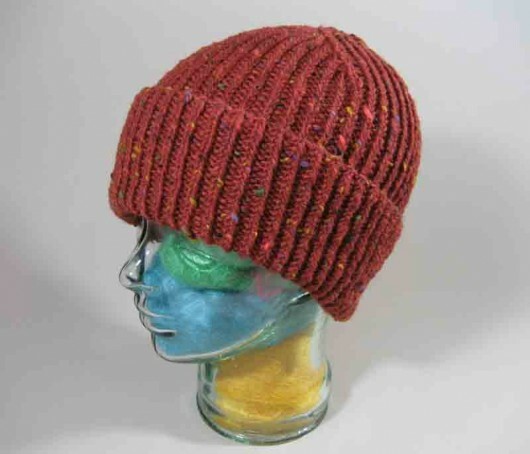 The Marsan Watchcap uses a one-one rib, with a twisted knit stitch. The twisted stitch adds interest, without being fussy. To help keep the cuff folded in a set spot, she uses a turn in the round at the point of the cuff-fold. But it’s the top swirl that distinguishes this cap. 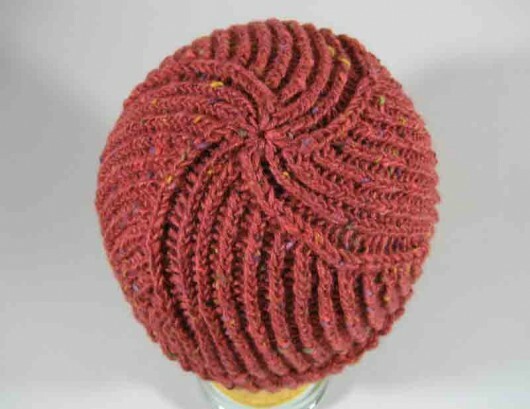 As long as the hat isn’t too tight, the flexibility of the swirl allows the cap to sit nicely and comfortably on the wearer’s head. Plus it looks cool. No little pointy top to this watchcap. The pattern is adjustable by multiples of eight without affecting the top swirls. I modified the pattern by using 104 stitches rather than 88. 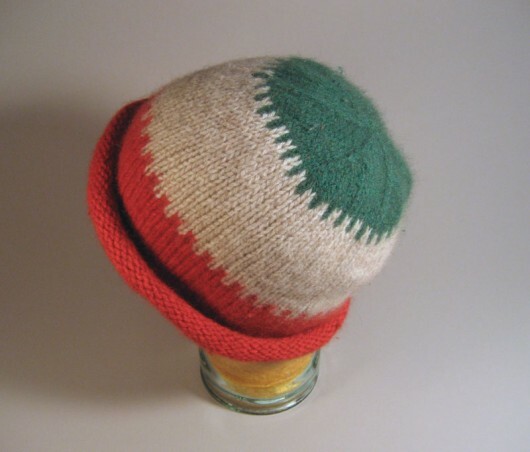 My first version, at 88 stitches and with Brown Sheep Lamb’s Pride Worsted, was too small for all the pumpkin heads in my family. 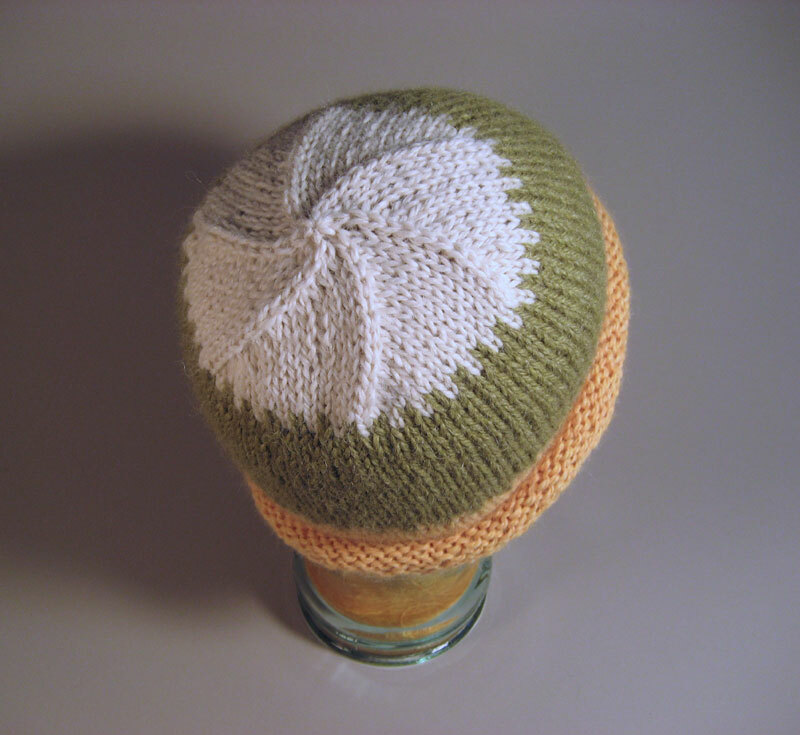 In the ones you see here, I followed the pattern and knit a 24 round cuff, but then I lengthened the hat by 10 rounds before beginning the decreases. And I decreased down to 16 stitches, instead of 24. That’s the other thing about most watchcap patterns. You can easily modify them to suit the head that will wear it. If you have some vanilla hat folks in your vicinity, challenge them with this one. It’s got just a dab of extra style, without in any way going over the top. 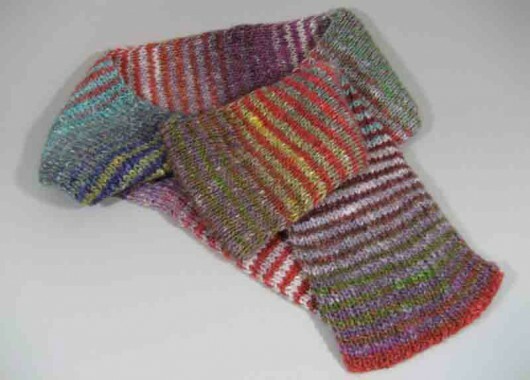 These are knit in Tahki’s Donnegal Tweed. 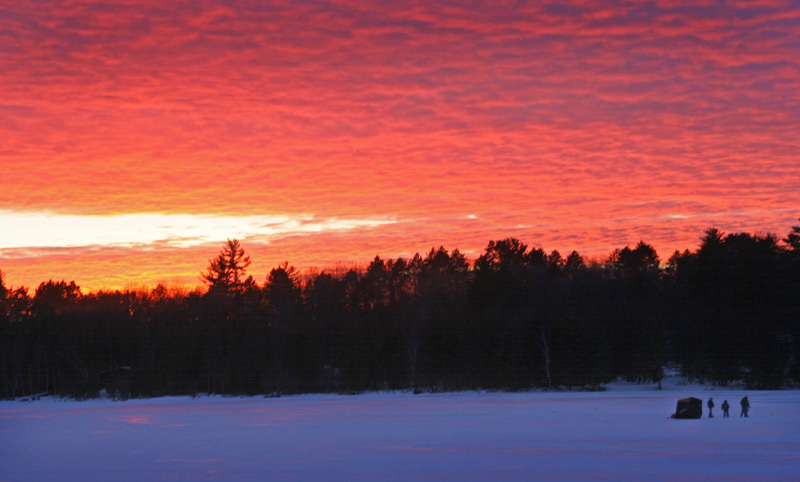 Our young neighbor Zach says the walleyes on Hillman’s Long Lake bite most frequently through the ice at twilight. They are probably so distracted by the beautiful sunsets that they lose their sense of self-preservation and just decide to nibble those tasty minnows after all. 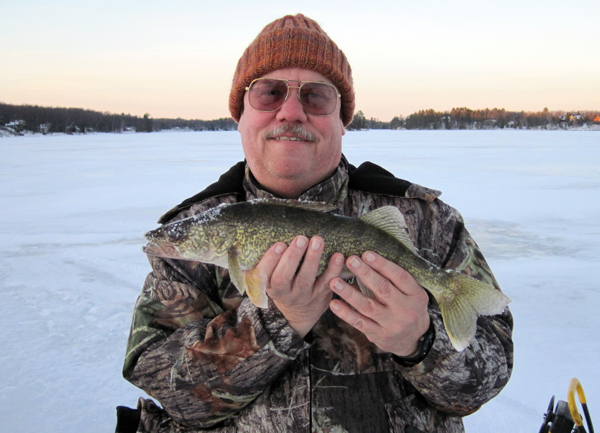 Steve caught this nineteen-incher a little before sunset, on a tip-up. 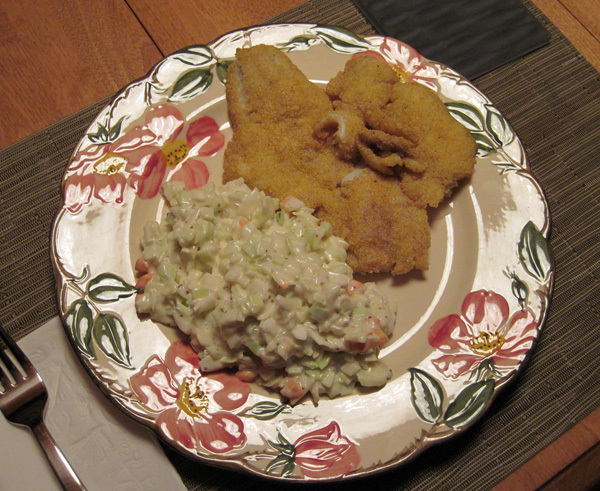 Not much later than an hour after this fish was swimming in the lake, we were eating walleye for dinner. Very tasty! 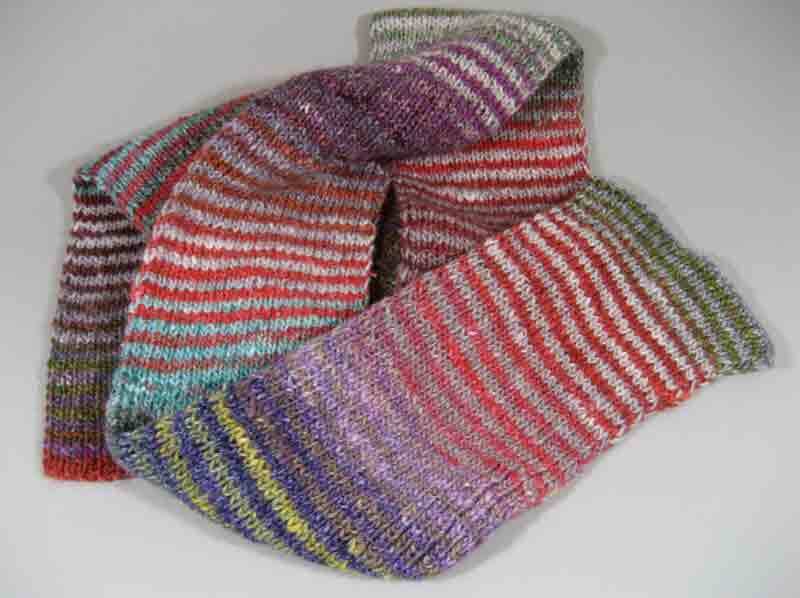 Another Jared Flood two-colorway Noro scarf. This time, worked up in Silk Garden. 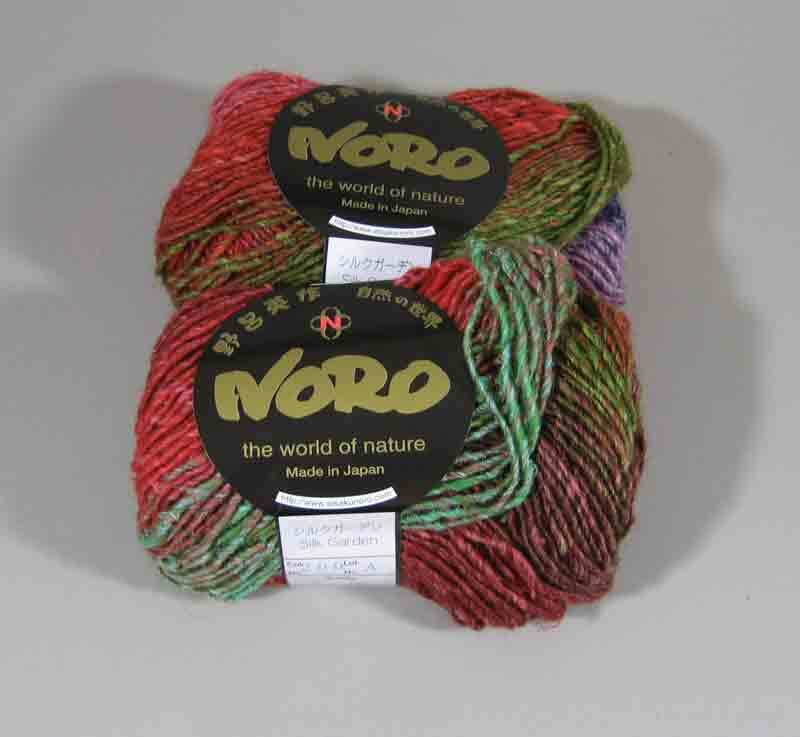 Very yummy yarn of silk, kid mohair and lambswool. You do have to take out a mortgage to pay the yarn bill, but it is so worth it. Steve parks in Lot 20. His new coat has no hood and some special yarn seemed like a good idea. This scarf of many colors fits the bill.